If you are nor familiar with this image then you are perhaps not alone. 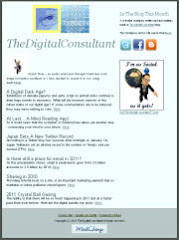 It is a QR Code ® and this one is for thedigitalconsultant blog's URL. Such coding will becoming increasingly obvious on magazines and as prevalent as the barcode which appears on most products. A 1994 Japanese invention, the QR Code is a two dimensional code (matrix code) which you can read on mobile phones that have a camera, smart phones and dedicated QR scanners. The beauty of it is that you can encode text, site URLs, and other data that you wish to share. 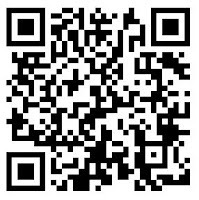 The QR code (its name is short for quick response) was developed to promote quick identification and processing. They have moved quickly from being a geeky novelty to an item that should be included in all digital channel communciations and deployment. With the rapid deployment of smart phones expect Q Codes to be increasingly used in all forms of advertising - on buildings, buses, print material and even on business cards. Even shopping will be quicker. Imagine you are reading an article in a magazine and you spot a QR Code. All you need to do is get your phone with its free QR scanning software and scan in the QR code. One quick scan and you are instantly transported to the relevant website to get additional information. Simple - no keyboarding required. So how do you go about creating Q Code for you company or personal use? The answer is very simple using this free tool from Kaywa. Those industries who rely on handscanners can use Q Codes to revolutionise their businesses and the scanner process will be considerably cheaper than the hardware currently in use. A cellphone with a camera is all that is needed. 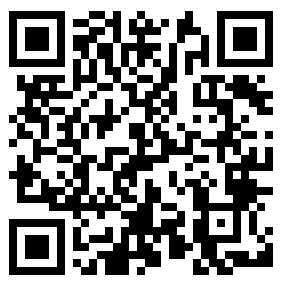 Here is an example of QR Codes being used in the manufacture of electronics and if you would like to learn more about the technical side of this data encoding system I would recommend a visit to QR Code.com.